In the Catholic sacrament of confirmation, the participants receive the blessing of the Holy Spirit, making them “perfect Christians” in the eyes of the Church. This ceremony is a large step in the progression of the Catholic faith, and often calls for celebration. 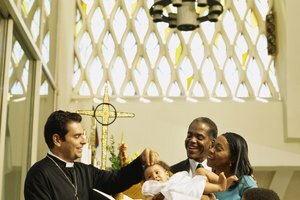 If your son is receiving his confirmation, the day will be a memorable one for your family for years to come, and you want to make his confirmation gift equally as memorable. Buying jewelry for a young man may seem taboo, and it won't be right for all boys. However, there are a number of pieces of jewelry designed just for spiritual young men to represent their faith. Some retailers sell necklaces that look like a soldier's dog tags, which most boys will enjoy. These necklaces can have an even deeper meaning, as the New Advent Catholic Encyclopedia advises that those who have received the sacrament of confirmation can be considered “soldiers of Jesus Christ.” These dog tags can be engraved with many things, from the boy's own name or initials to the Lord's Prayer. You can also find necklaces and bracelets designed for boys in other styles. As opposed to a golden cross, consider one made of metal or steel. Similarly, small bracelets made of brown or dark blue beads can feature his initials or a small cross. This type of gift can help you son keep his faith close to his heart while not being embarrassed by gaudy or flashy jewelry. Personalizing your son's confirmation gift can make it all the more meaningful for him. Rosaries, books and even pen sets can be engraved with your son's name and the date of his confirmation. One of the most popular personalized gifts is the picture frame, which can feature a picture of him in his ceremonial dress. Frames can be engraved with your son's name and the date of the confirmation. Aside from engraving, there are other ways you can personalize your son's gift. 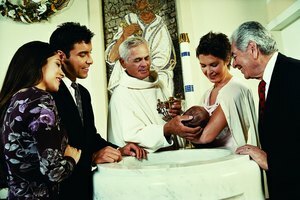 Make a scrapbook or photo album of his spiritual journey, beginning with baptism and continuing through the confirmation. This will allow your son to look back and see how far he has come with his faith. You can also leave room for him to continue the remembrances and he continues to grow in the Church. Not all confirmation gifts have to be serious. Young men are often more concerned with the fun than the sentimental, and you can fulfill your son's urge for fun in a spiritual way. For instance, books and games have been created around the Catholic faith that can keep your son entertained. Look for book titles like “Did Jesus Have a Last Name and 199 Other Questions from Catholic Teenagers,” or games like “Outburst: Bible Edition.” Faith does not have to be stuffy and boring, and sometimes a young man could use that kind of reminder. Volz, Samantha. "Confirmation Gifts for a Son." Synonym, https://classroom.synonym.com/confirmation-gifts-for-a-son-12080147.html. 29 September 2017.